Over 17,000 new Marines graduate from MCRD San Diego every year. In order to complete that mission successfully year after year, the Marines, Sailors, and families within the Depot and WRR (Western Recruiting Region, or western half of the US) are expected to maintain a high level of performance in a fast-paced and stressful environment. Mission success typically comes at the cost of spending time with their families and pursuing personal development. Through our Depot and WRR Support Programs, the Museum provides opportunities for both. Outstanding performers are recognized and awarded, educational scholarships are provided, and family events that would have been an out of pocket expense are covered, as a way of doing more than just saying "thank you for your service." 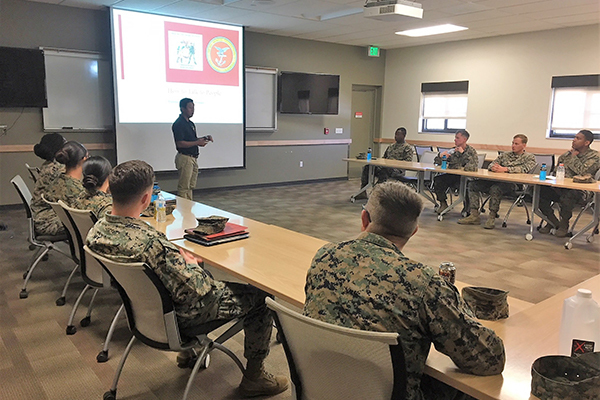 Unlike most traditional programs which help service members transition out of the military into the civilian world, the Leadership & Education Program provides "pre-transition" readiness training to active duty Marines before they start the process of becoming a civilian. Because most Marines start thinking about transition just months ahead of time, this program solves that problem by planting the seed early and providing a network of trusted veterans who have "been there and done that" to help them when they are ready. 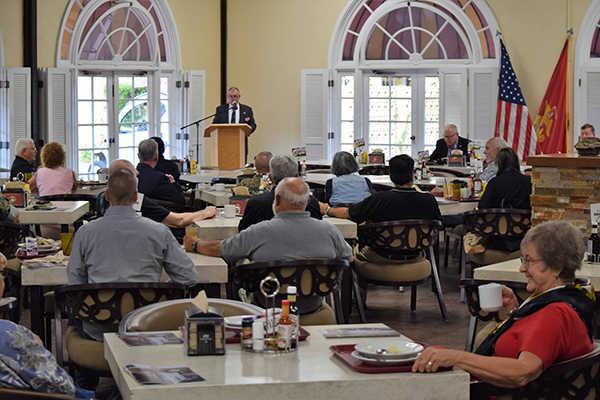 Every three months, a Quarterly Breakfast takes place in MCRD’s Duncan Hall. Museum members and active duty service members stationed on the Depot are invited to enjoy a chow hall breakfast on us before listening to a guest speaker from the military and/or local community. Breakfasts typically takes place on the second to last Tuesday in January, April, July, and October. For information about our next Quarterly Breakfast, check the events calendar, sign up for our monthly email, or follow us on Facebook. Each year, the Foundation awards three $1,000 scholarships under its Colonel Nate Smith Scholarship Program. Scholarships are typically awarded each summer before the start of a new school year. Applications are open to enlisted Marines, Sailors and their dependents assigned to Marine Corps Recruit Depot/Western Recruiting Region, San Diego. Scholarships are awarded based on academic performance, community and extracurricular activities and future potential. Applicants must be High School seniors or graduates and must provide proof of enrollment in a graduate or undergraduate program. Application forms are available below or can be picked up at the MCRD Museum Foundation office, Building 26 on MCRD, San Diego. Please call us at (619) 524-4426 for more information. Each year the MCRD Museum Foundation awards three Drill Instructors on MCRD San Diego with the Drill Instructor of the Year Award. We are proud to honor the top Drill Instructors for the year, who work relentlessly to turn young men into Marines. Selections are made by the Commanding Officer, Recruit Training Regiment, Marine Corps Recruit Depot, San Diego. For information on the program, drill instructors should contact their battalion Sergeant Major. 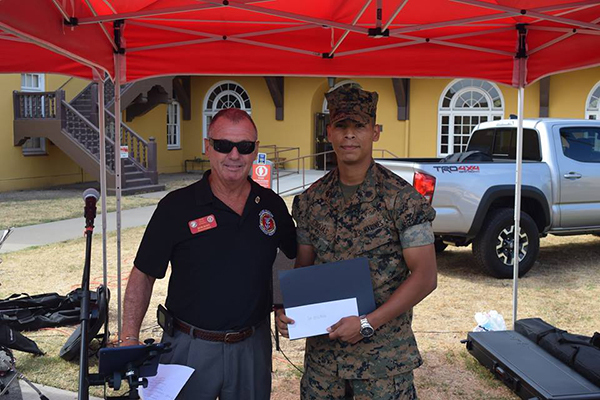 Each Drill Instructor of the Year will receive a cash award from MCRD the Museum Foundation. MCRD San Diego is not only the home of recruit training on the west coast, but also the headquarters for the Western Recruiting Region and Recruiter School. To recognize the dedication of our top recruiters, and their important role in making the next generation of Marines, the Museum Foundation provides cash awards to those named Recruiter of the Year. Annually, the MCRD Museum honors one of its top volunteers and hosts a celebration to thank all Museum & Foundation volunteers. This not an official USMC website. THIS IS A NON-FEDERAL ENTITY. IT IS NOT PART OF THE DEPARTMENT OF DEFENSE, OR ANY OF ITS COMPONENTS, AND IT HAS NO GOVERNMENTAL STATUS.